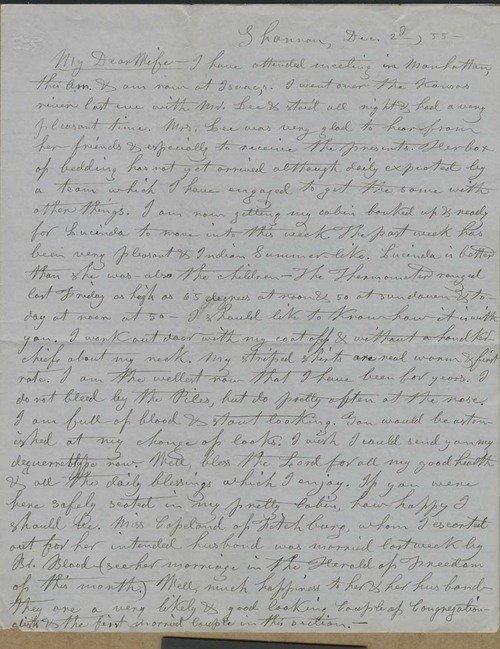 William Goodnow wrote a personal letter from Shannon, Kansas Territory, to his wife, Harriet, in New England. Goodnow reported that his health had never been better, as he was "full of blood & stout looking" and commented that he wished he could send her his daguerreotype to show her his appearance. He mentioned that the settlement had just witnessed its first marriage and first baby born, and that Samuel Pomeroy of the New England Emigrant Aid Company would soon be among the settlers of the area.